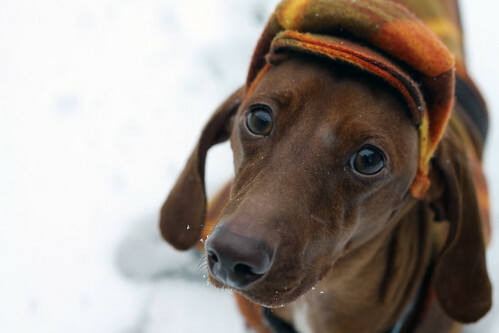 Happy Holidays and happy first week of winter from News-Geek.com and our mascot, Herbie the Wonder Dachshund! View a larger version through my Flickr account. How do you plan to ring in the new year? Herbie’s initials spell “HAM.” We think this is cute and moderately funny. We interrupt the commentary on all things editorial, political, and tech-related to bring you… just what the header says: stuff–on my dog. Last week, I visited YoungUrbanPuppy on Etsy, a great eBay-inspired shopping-cart site that allows creative types to sell their custom-made wares to consumers worldwide. If you’re into unique art, clothing, and accessories, I highly recommend shopping there. The above outfits were part of my first Etsy purchase, and I’ve got to say I’m really pleased. The Mario costume brings me back to my childhood, while the smart trench coat and hat make Herbie, my eight-month-old miniature dachshund, look like a dapper Sherlock Holmes. Jenielle (YoungUrbanPuppy) did an excellent job on the outfits. They’re fitted with Velcro straps so that even if Herbie grows, he’ll still be able to wear them. So here’s my shout out to Jenielle, her dog Parsnip, and all of the people who’ve made Etsy possible! Thanks, guys! Well, despite the career change, I do keep my ear to the ground for new media tools. Right now, I’m interested in Stupeflix, a really simple to use audio-slide show tool that lets you create seamless videos in Flash and for YouTube in a matter of minutes. While Stupeflix is definitely more useful for your average user than to professional journalists (to whom I strongly recommend Soundslides), I will say that Stupeflix is quite innovative: It provides a simple and speedy API to process images, sounds, and other components into videos with relatively complex visual effects (complex for a Web app, anyway). Furthermore, the API allows users to create content and applications quickly and easily for the Web as well as Apple’s iPhone. Lastly, the interface is so clean and simple that even a Web novice would have little trouble generating content and getting it onto YouTube. Here’s a video I made with pictures of my new puppy. All told, it took me about 10 minutes (including interruptions).